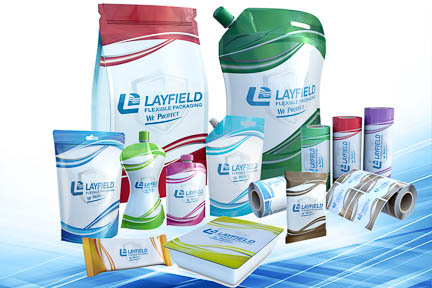 Present your unique cereal, protein, chocolate or ice cream bars using rotogravure, the best high-definition printing capability available while maintaining product freshness and integrity using Layfield’s high barrier performance films. Layfield can customize your film to ensure maximum line speeds and down-gauged film for maximum efficiency. One of the most popular packaging formats for horizontal flow wrap is using cold seal, a pressure sensitive technology that requires no heat. Cold seal is a water-based, food-grade adhesive that keeps products sealed yet is easy to peel open . This type of packaging is best for heat sensitive products that may melt or get damaged by exposure to heat such as chocolate, ice cream, and baked goods with icing or coating.